They’re twins! No, not Joel and Luke Smallbone, the Australian brothers who are at the core of the band for KING & COUNTRY. We’re talking about the dual Grammy trophies that the band took home in February 2015, triumphing in both of their nominated categories with their sophomore album, Run Wild. Live Free. Love Strong. “When we won those awards, it was obviously shocking,” says Luke Smallbone, noting the better-established acts they were up against. 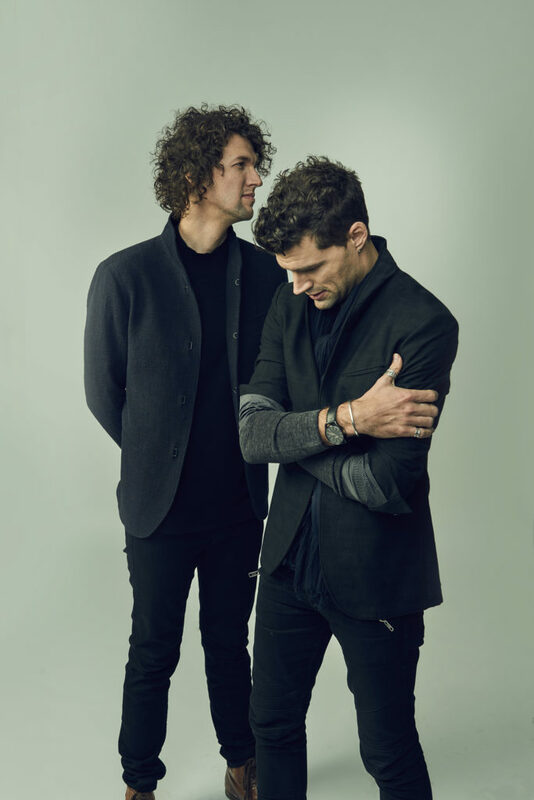 “The songs from the album are very personal and maybe the Grammy voters could sense that?” Naturally, the guys in for KING & COUNTRY weren’t actually doing it for glory or Grammy, but if their candor happens to be validated with kudos, they’ll take it. The awards came at the peak of a heady season for the brothers, who first caught the attention of the mainstream in America around the time that Billboard magazine named them one of the publication’s “New Artists to Watch for 2012.” They made good on that prophecy with a debut album, Crave that made them not just a blip on the radar, but put for KING & COUNTRY on the map. Two years later, Run Wild. Live Free. Love Strong. was released and debuted at No. 13 on the Billboard Top 200 and No. 2 on iTunes; the lead single, “Fix My Eyes,” reached the top spot on several radio formats and landed the band on The Today Show and Jimmy Kimmel Live. The album has since been RIAA certified Gold and the band has exceeded 200 MILLION streams. But when they won those Grammys, they were humbled… and not just in the 21st-century, figurative sense of the word. “Our family was the Australian version of the Von Trapp family singers,” Joel laughs. “We probably toured together on and off for a decade.” And all that, mind you, was before for KING & COUNTRY was even formed.” But let’s backtrack still further. Their father was a concert promoter in Australia, who’d bring the children down to the halls to watch the bands. But after he lost his shirt on a tour, it was time for the family to sell everything they owned as dad took a job in America… an offer of employment that evaporated as soon as they arrived in Nashville. All but penniless, the family took to sleeping on beds of clothes, raking leaves, and scrounging for quarters in pay phones to survive, even as the kindness of strangers became something the itinerant family found themselves able to rely upon. The two brothers were rivals in their teen years. Joel keen on being a solo artist and Luke planning on pursuing football… until he suffered an injury that put the kibosh on those plans. At that point Joel, who was already more musically inclined, suggested that maybe they could try singing together, while Luke’s knee healed. Out of that came the kind of harmonies that only close blood relatives can produce. Rather than compete for lead vocals, they settled into a complementary approach that echoed their off-stage personalities. Luke, a little more laid-back, has a voice that is particularly rich in the highest and lowest ranges so he tends to sing lead on verses. Conversely Joel, who is a bit more aggressive, is at his best in a blustery middle range that is perfect for getting loud on what they jokingly call the “Shouty” and anthemic choruses. For a long time they went nowhere, “Five years after we started, nothing was happening. But when we look back now, we realize that we were both waiting for the other to give up,” Luke admits. Even the inability to settle on a name seemed to symbolize their floundering. But finally, their persistence paid off. Their 2012 debut, Crave, induced a craving among listeners to the tune of 410,000 track sales and over 9 million streams. But before they could get to their even more acclaimed sophomore effort, there would be more tough personal roads to hoe. In the Fall of 2017 the band released their first full-length Christmas album, Christmas | LIVE From Phoenix, featuring their extremely unique & highly energetic cover of the classic, “Little Drummer Boy.” Its live music video was the most reactive Christmas video of the 2017 holiday season with over 300,000 shares on Facebook and more than 14 million total views. They are currently at work on their third studio album, which is due for release in 2018. We write music about the human experience, plain and simple,” Joel says. “Some of the songs are spiritually inclined. Some of the songs are romantically inclined. Some of the songs are about struggle. We want to include everyone who’s felt these things in the story of each song. I do believe that, in being honest in the arts particularly with where we’re coming from and where we’re going, we’re able to spur each other on. And then the beauty of music is that it has the ability to bypass the head and go straight to the heart.” For king, country, and a spot deep in the chest cavity it is, then.